Mid-20th century economists, most notably John Kenneth Galbraith, predicted that large companies would be responsible for most of the groundbreaking innovations in our future. History has proved them dead wrong. In fact, the opposite has turned out to be true. Startups – entrepreneurial companies – are the engine of innovation in the modern economy, and as a result they grow disproportionately faster than large, established firms. And this is true both in terms of their average growth rates and in terms of which companies are more likely to be super-high-growth outliers. Big firm fans: Before you argue by naming your favorite big-firm innovator, review the quality research on this subject. A large academic literature has thoroughly looked at “Gibrat’s Law of Proportionate Effect” in firm growth rates. That's a baseline model where small, new companies and large, established ones innovate and grow proportionate to their size. If that were true, then entrepreneurship and intrapreneurship would be equally effective. But this literature consistently finds disproportionate growth rates (and more dispersed growth rates) among smaller, newer organizations. We can debate nuances, such as whether large organizations help by investing in R&D that later appears in the innovations of startups, or that there are some exceptional big-company innovators, but there is no doubt of the main finding: Entrepreneurs outperform intrapreneurs. But what about the studies showing that innovation helps big firms improve? Two problems here. First, when innovation does help large firms, the improvements typically don't kick in until after a difficult and painful period of adjustment. In fact, often large companies fail outright while trying to adjust to innovation. Second, this is a false comparison anyway. Sure, compared to its tired, old self, an innovative big firm is improving. But the correct comparison is to the entrepreneur. Now you may be wondering, don’t new companies also fail at a higher rate? Yes, they do, but the growth created by the high-growth survivors more than compensates for the economic losses due to failure. Plus, failures fuel future entrepreneurship; the “creative destruction” described by Schumpeter. In any case, if you’re looking for big success, look to entrepreneurs – not to the intrapreneurs funded by large, established companies. Groundbreaking new innovations are typically "nonconsensus" ideas when they start out. That is, some think they are a good idea, but many disagree because (by definition) groundbreaking innovations defy conventional wisdom. I recall when the consensus said that internet search was not a good business. After all, we had seen the failure of Lycos, Excite, Alta Vista, and a bunch of other search firms. So when Google came along few people wanted to fund them. Now, my marketing colleagues tell me that search is the greatest business in the history of humankind. In this way, we're often very bad at predicting which innovations will succeed. But we're so good at retrospectively rationalizing, we forget how bad we are at predicting. Of course, not all nonconsensus ideas are brilliant. In fact, often they are really bad ideas. We won't know for sure until an entrepreneur proves their genius (or folly) by experimentation. Nonconsensus ideas are not necessarily better, they are just higher variance. Let's say these are plots of the number of innovations produced, ranging from really foolish (far left) to really genius (far right). 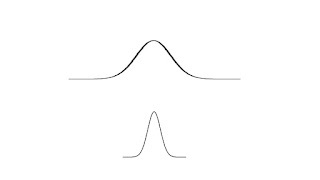 The top distribution is a high-variance distribution, while the bottom distribution is low variance. Both have the same average, but the top distribution has much more genius (and folly) than the one on the bottom. Nonconsensus ideas are high variance ideas, like the top distribution. 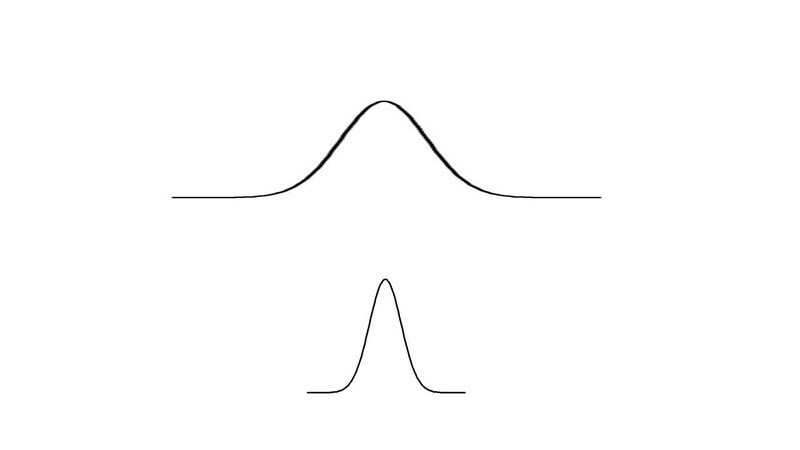 If what we want are some really great innovations, we want to generate high-variance distributions like the one on the top. Entrepreneurs are unpredictable, and uncontrollable. So they are very high variance, looked at as a group. Many are complete fools, and some of the fools will turn out to have been geniuses once we see how history develops. By contrast, intrapreneurs operate within a corporation. They need to justify their expenses. And, even if they are given a great deal of latitude, they must at some point explain themselves. The need to answer to a big, established firm renders intrapreneurship low variance. For instance, I remember when Hewlett Packard was the model of big-firm intrapreneurship back in the 1990s. I was studying their venture into video networking, a very entrepreneurial move. Jim Olson ran their video division just like a startup, even imitating the physical surroundings and culture of a start-up company. But every year he would have to attend the budget meetings, where the meager returns of the video division were dwarfed by the billions being earned in other parts of the company. So it was that the division began to market a printer that would sit atop your TV, since corporate understood printers. This move helped them in the budgetary negotiations, but in so doing it moved them from high-variance entrepreneurship to the safely low-variance world of intrapreneurship. Once an idea is surfaced, the innovation process has just begun. The process of "selection" involves testing the idea in the market. You've probably heard a lot about this process: The innovative firm quickly gets its idea into the market in an effort to improve by failing fast and cheap. This process improves the idea by iterating through trial and error. What you may not realize is that the real beauty of the selection process is when the market test leads to unexpected outcomes - discovery. The most innovative applications of ideas are not the anticipated applications, but rather those that materialize along they way. There is a long list of innovative companies that became raging successes after discovering their unexpected brilliance, including Airbnb, NetApp, and Apple (to name just a few). When it comes to discovery, entrepreneurship again has an advantage over intrapreneurship. The intrapreneur's iterative tests are seen through the lens of the parent organization. Imagine when Airbnb was first discovering itself. Had its model been tested by the folks at Hilton or Sheraton, odds are they would not have recognized the very different logic at work. Similarly, NetApp's innovative file servers would have made no sense to IBM - nor would have Apple's odd experiment with iTunes. All these experiments were based on logics that made no sense to the establishment. Now you may be thinking: Intrapreneurs also engage in discovery. Yes, but they do so through the lens of the status quo. When it comes to discovery, the lens of the status quo creates blinders. By contrast, the entrepreneur can see things in ways that the intrapreneur cannot. Implications for startups: If you're getting push-back because your idea is nonconsensus, that's a good thing. If the big-company people like your idea, it is time to worry. And if your plans are not working out as planned, that's a good thing; you're discovering. Implications for big, established companies: Don't reward good innovation. Reward high-variance innovation, good or bad. Evaluate your innovation processes in terms of how they affect variation and selection. Stamping out foolishness? Well, there's your problem. Implications for budding entrepreneurs: Tempted to take a big-company job to gain the experience you need to start your own business? Don't fool yourself. Take a look at my research on this topic: Joining a large, established organization dramatically reduces your chances of ever becoming an entrepreneur. Taking that job cuts your likelihood of starting a company by up to 75%, depending on how large and well-established the company is. Go ahead and join a big company, but be honest with yourself about the decision you are making. For a study looking at the importance of nonconsensus to entrepreneurship, see my paper with Elizabeth Pontikes. A good example of the academic work on growth rates of firms can be found in this article by Costas Askolakis. For evidence of how working for a big company affects your chances of ever becoming an entrepreneur, see my paper with Stanislav Dobrev.